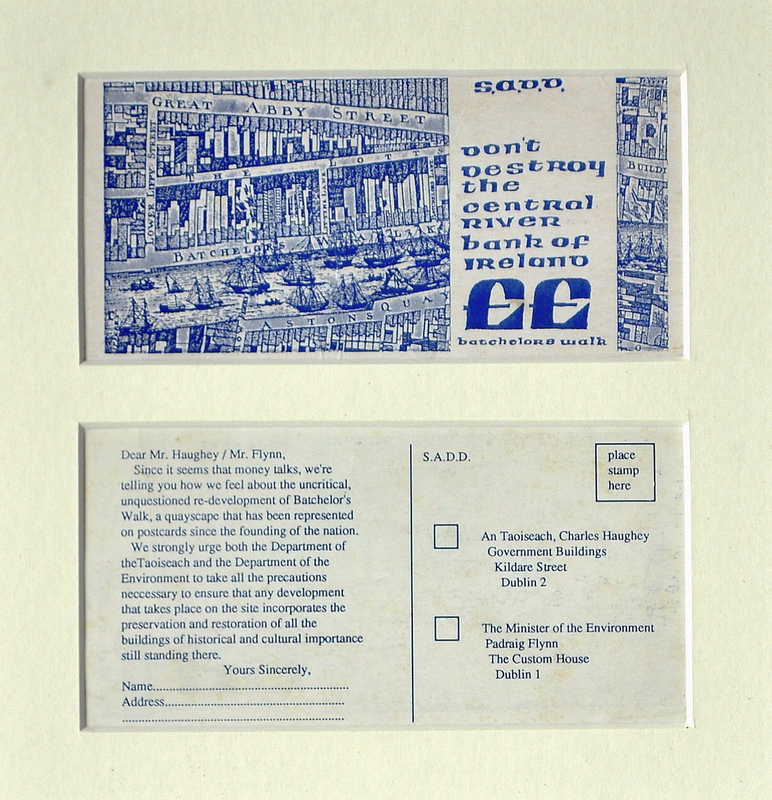 In 1988, a group called Students Against the Destruction of Dublin produced these postcards for citizens to send the Taoiseach and Minister of the Environment to oppose the redevelopment of Bachelor’s Walk, which contains some of the most important early 18th Century houses in Dublin. At the time, buildings were being acquired by a development company, and the postcards urge the government to ensure that any development preserved the buildings. Watch Ian Lumley discuss the significance of the postcard. It was a historic visit, not least because Kennedy, a young, dynamic Irish-American, had long made much of his Irish roots. Kennedy was mobbed by autograph hunters at a garden party held in his honour at the home of the President. 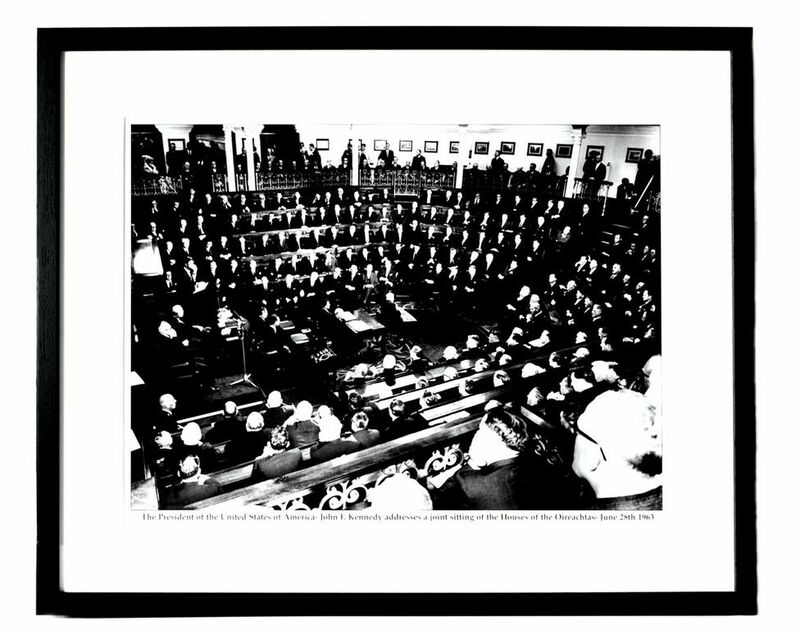 His address to both houses of the Oireachtas on 28 June was a bravura performance; a sort of homecoming, as the Irish Times noted. During his speech, Kennedy described his heritage, made an attack on literary censorship and noted – to the delight of the assembled politicians – that Leinster House “does not inspire the brightest ideas.” Six months later he was killed in Dallas, Texas. 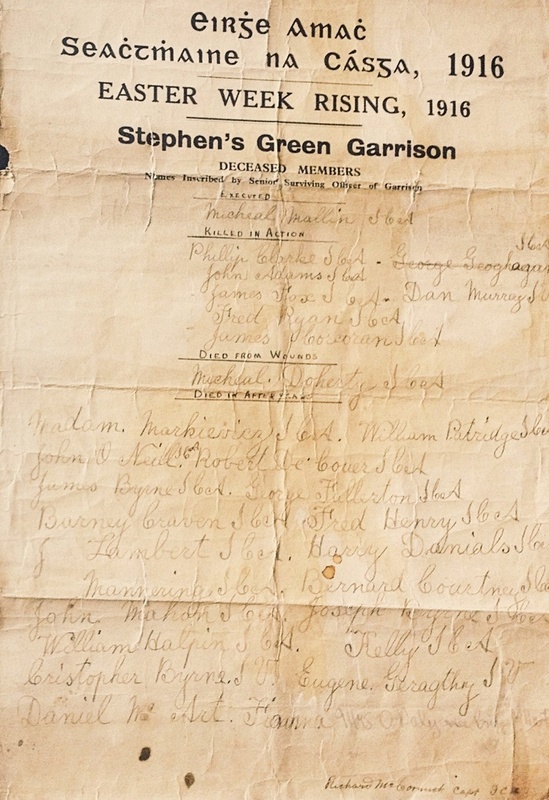 Michael Mallin’s garrison of 200 men was camped across the road in the Green during the Rising. (Countess Markiewicz was his second- in-command). The British forces made use of the high buildings surrounding the square to gain the upper hand on the rebels. Each morning both sides halted fire in order to let the ducks in the Green be fed. Eventually the rebels were forced to retreat to the Royal College of Surgeons on the other side of the Green. The casualties are remembered on this gory souvenir placard from the 1940s; as you can see, Mallin was executed for his part in the Rising. It is arguable that the most positive decision made by the new Free State government was to build the Shannon Scheme. The project cost £5.5 million, which was about 20% of the government day to day expenditure at that time, and it involved the construction of Ardnacrusha Power Station. Critics of the scheme said it would be a White Elephant as the demand for electricity would never be sufficient to justify the project costs. They were wrong. 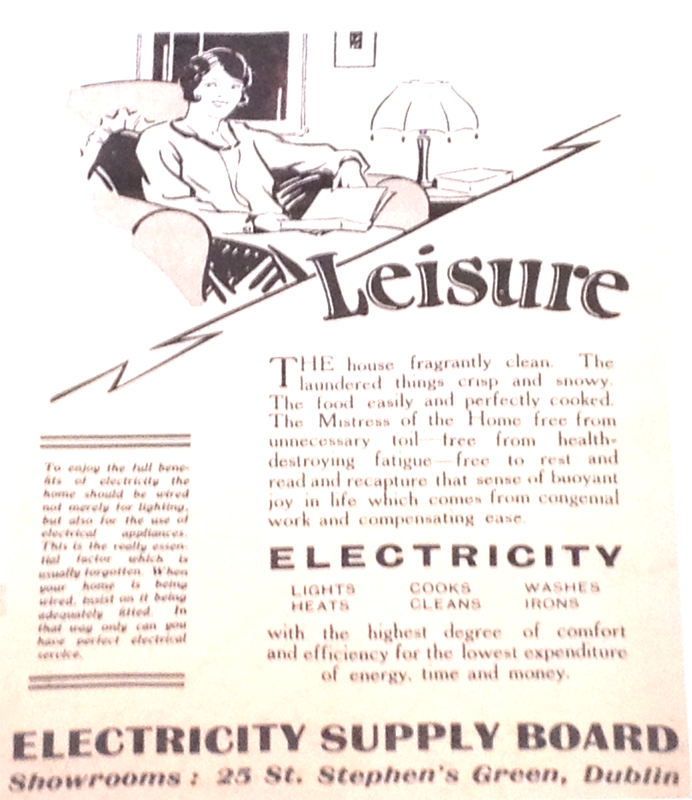 There was a huge growth in electricity sales from 43kWh hours in 1930 to 218kWh hours in 1937. ESB’s first showroom at 25 St. Stephens Green was part of the success story. Opening in 1929, it sold £315.6sh.8d worth of electrical equipment in its first week of business. 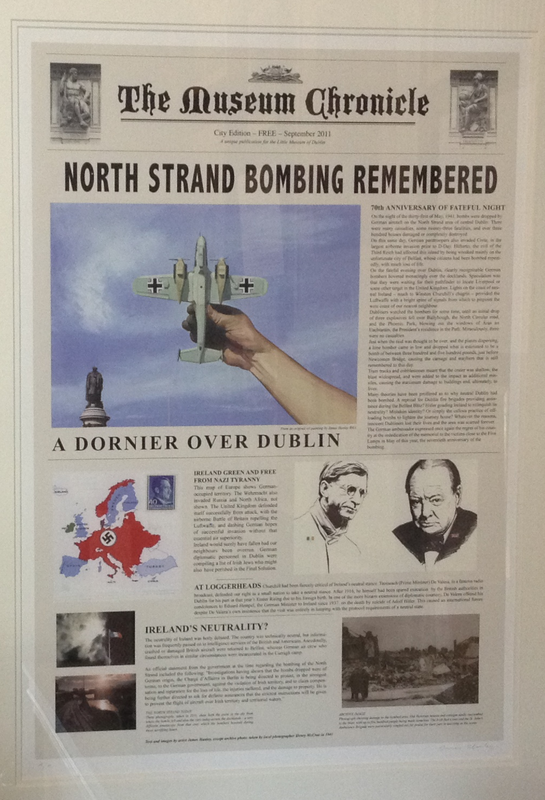 James Hanley-Rha deals with a key moment in 1940s Dublin – the bombing by German aircraft of the North Strand area of the city, where he lives and works. Whether accidental or otherwise, the killing of some 23 innocent Dubliners and significant destruction of property brought Nazi aggression to these neutral shores. 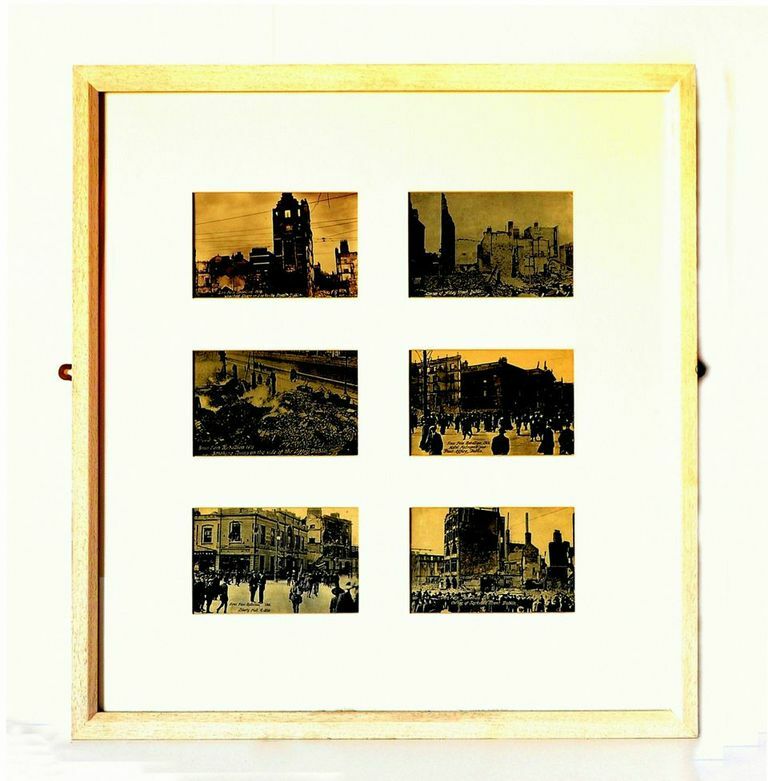 He describes the event using an invented illustrated broadsheet, referencing how the events were told at the time, which includes his original artwork as well as photographs of the area. In ascending order (left): wrecked shops on Sackville Street, smoking ruins on the side of the Liffey, the shelled remnants of Liberty Hall (headquarters of the Irish Transport and General Workers’ Union). (Right): damaged buildings on Abbey Street, the remains of the Hotel Metropole and the General Post Office, and the scene on a Sackville Street corner. 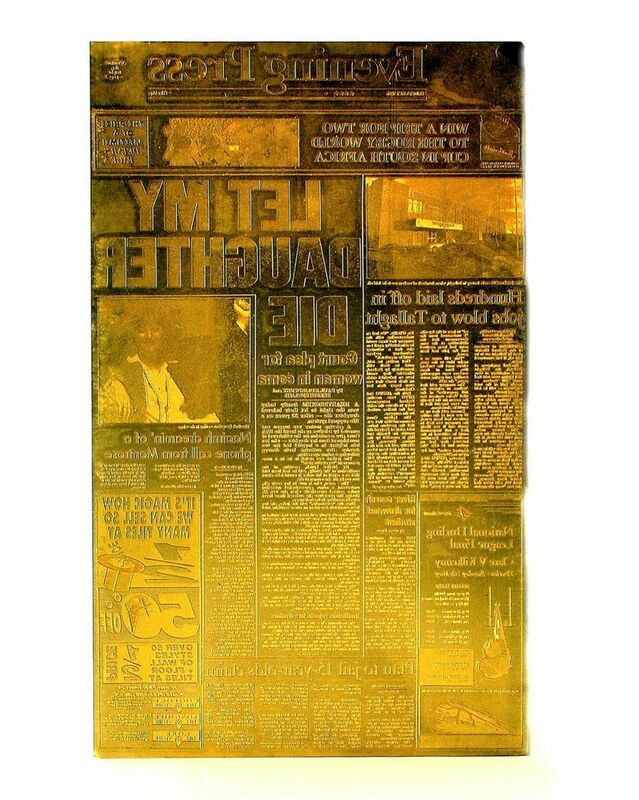 The Evening Press was the most popular evening newspaper in Ireland from 1954 to the mid-1990s, with sales at one point of 175,000 copies a day. 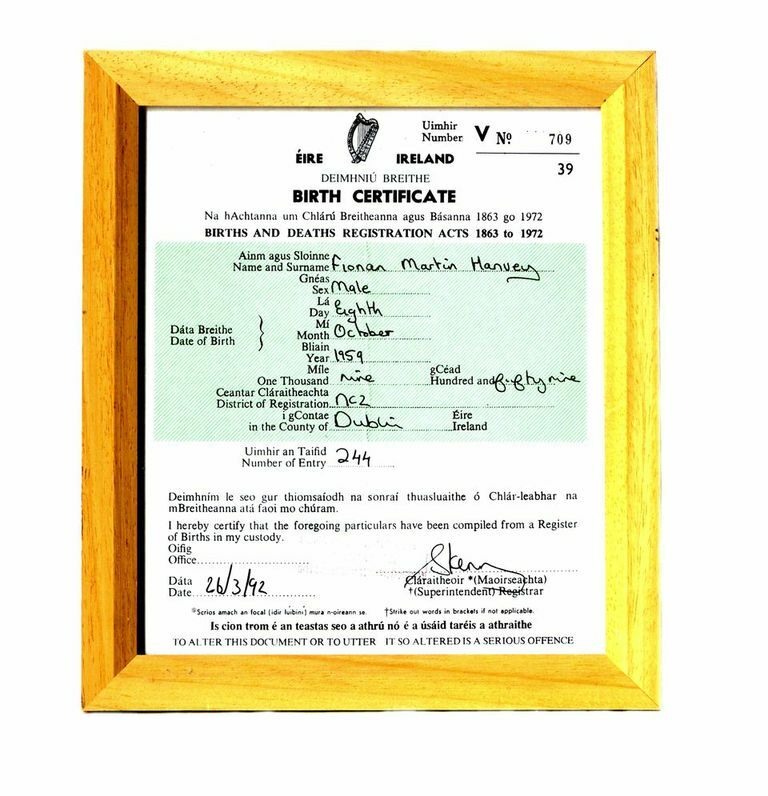 It published nearly 10,000 cartoons by ‘Till’ (George O’Callaghan), the most prolific cartoonist in the world, and the early work of journalists Con Houlihan and Vincent Browne. Strange as it now seems, air travel was once perceived as a glamorous activity. 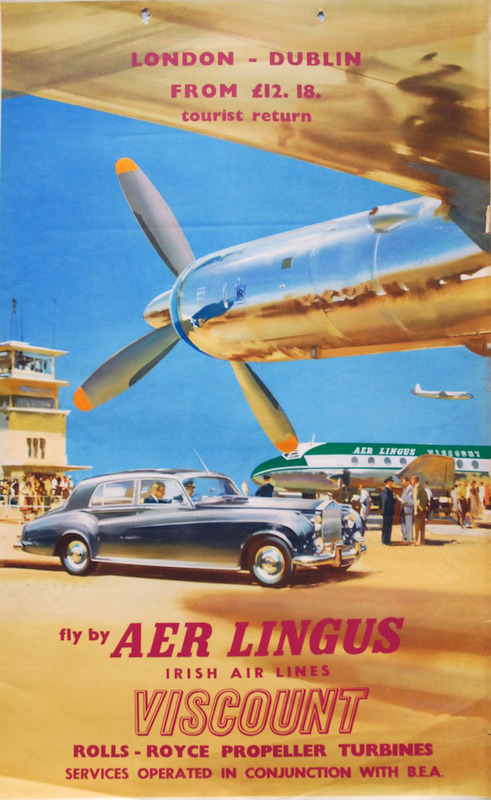 This elegant poster advertises the Aer Lingus service between London and Dublin, costing £12. 18 for a return flight. The Battle of Jutland was one of the key naval engagements of the First World War. HMS Dublin played a part in the battle, which was fought in 1916. The ship had been adopted by a committee of Dublin citizens and businessmen who raised funds to provide it with a band and other amenities. 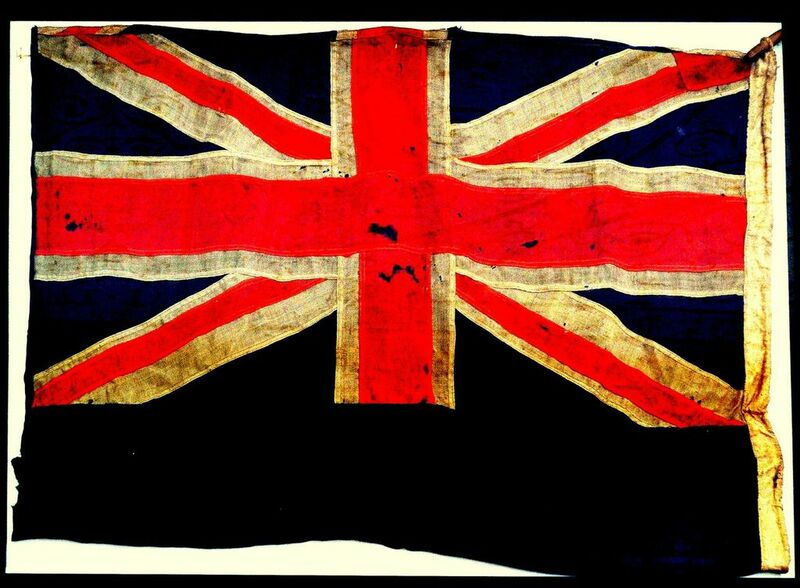 When the ship was decommissioned in 1926, Dublin Chamber of Commerce was presented with its battle-scarred ensign – complete with Union Jack – and in turn the Chamber donated it to Christ Church, since when it has languished, unseen, in the cathedral crypt.